Female Iranian taekwondo fighter, Sara Khoshjamal-Fekri, has been defeated by her Taiwanese rival Yang Shu-chun in her 2nd Beijing fight. Khoshjamal-Fekri lost 2-0 to the Taiwanese athlete in the 49 kg category on Wednesday. The 19-year-old Iranian won her first encounter 5-0 against Ghizlane Toudali from Morocco earlier in the day. Khoshjamal-Fekri can compete for a bronze medal provided Yang Shu-chun storms into the final. Yang Shu-chun defeated Gladys Mora from Colombia 1-0 in her first fight. 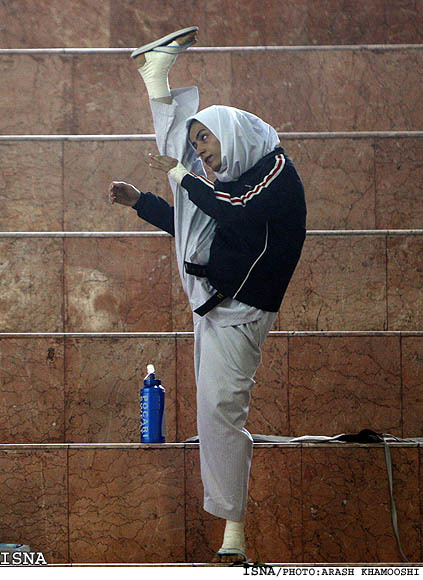 Khoshjamal-Fekri snatched the bronze in the Asian Taekwondo Qualification Tournament held in Vietnam in 2007.